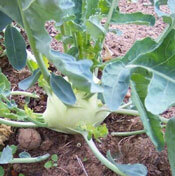 Kohlrabi is a round, turnip-shaped vegetable with a few leafy stalks growing out of it. All parts of the plant are edible. Easy to grow plant produces a sweet, tasty bulb that can be cooked or eaten fresh.